If you’ve thinking of getting a FitBit now that New Years is approaching and along with it, your fitness resolution, check out this current deal from Target. 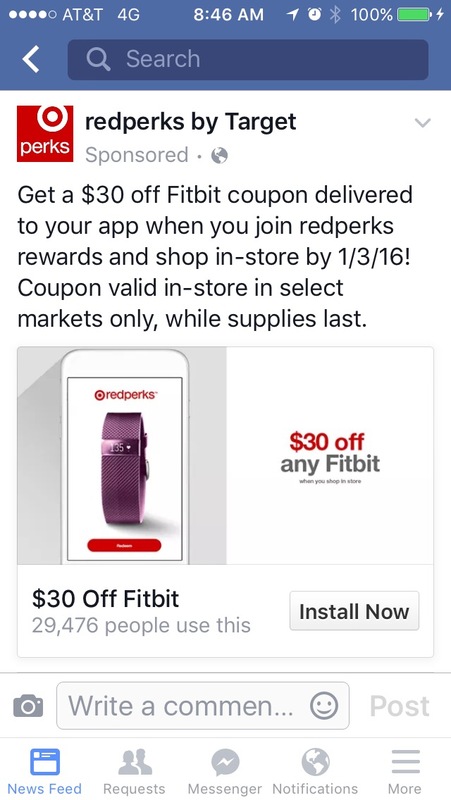 This ad caught my eye on Facebook today: install their redperks app and you’ll receive an automatic coupon for $30 off a purchase of a FitBit in store. The app’s just cool to have if you’re a Target shopper too- lots of extra deals & rewards for using it. « Recipe: Rudolph Chow – Perfect for Christmas! How did you get the coupon? I installed the app too but can’t find coupon? Me too….where is the coupon?? Sorry ladies – I didn’t see you commented until now. It popped right up for me when I downloaded the app. Wonder if it’s a coupon only being offered regionally? I’m in Philly.